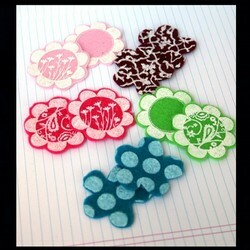 I was visiting Christy's blog today, and I saw these stinkin' cute felt shapes from my neighbor, Brooke (hi Brooke)!!! She has them for sale in her Etsy shop, and I know I am going to have to get some!!! You should go check them out! Thanks for putting these on your blog.